The mammalian taxonomic order primates, to which humans belong, also includes gorillas, chimpanzees, bonobos and orangutans, collectively known as the great apes; gibbons and siamangs, considered lesser apes; and nearly 200 monkey species. Monkeys are the most widely distributed, with species occurring in Africa and Asia -- the Old World -- as well as Central and South America, known as the New World. Apes, conversely, live only in the Old World. Aside from size -- apes are generally much larger than monkeys -- the most noticeable anatomical difference between the two is the tail, which is absent in the former. An exception to this rule is the Barbary macaque, a tailless monkey found in northern Africa and Gibraltar. Not all monkey tails are created equal, however. 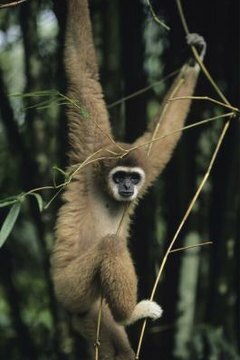 Several species of New World monkeys -- spider monkeys, for example -- have prehensile tails they can wrap around tree branches and other objects. No Old World monkey has this ability. The brain size to body size ratio is significantly higher in primates than in other mammals, and even greater in apes than in monkeys. More reliant on learned behaviors, apes can communicate and solve problems in more complex ways that their monkey relatives can. Moreover, in most primates -- Madagascar's primitive lemurs are a notable exception -- a larger portion of the cerebral cortex is devoted to sight than to smell. Both monkeys and apes therefore possess and depend on enhanced visual capabilities, such as depth perception, in lieu of olfactory acuity. Almost all primates have five fingers on each hand and five toes on each foot. Exceptions include the spider monkey, which has one fewer finger on each hand, and the thumb-lacking colobus monkey, an Old World species. In monkeys and apes, both the hands and feet are prehensile and can be used to grab and manipulate objects. Opposable thumbs that can move independently of the other fingers are a key feature of primate hands. The shoulder structure of apes enables them to swing from branch to branch using their hands. Monkeys, though more arboreal than apes, cannot perform this movement, known as a brachiation. While the great apes, even the largely arboreal orangutan of Southeast Asia, are too bulky to make full use of this ability, the lesser apes are adept at brachiation. The African great apes -- chimpanzees, bonobos and gorillas -- get around on all fours by leaning forward into their knuckles, which is aptly known as knuckle walking.